| Succulent Pizza Trivia That Will Get Your Stomach Rumbling! Aloha, Nick Husson here. It's pretty reasonable to assume the Hawaiian pizza came from Hawaii, right? What if I told you it was created up in snowy Canada by a Greek immigrant? The story of the Hawaiian pizza is a great one, and it's a great conversation starter. It begins with Sam Panopoulos, a professional cook from Greece who immigrated to Canada in the mid-1950s. At the time, pizza was pretty rare in Greece, but Sam's boat happened to stop off for a day at Naples en route, and Sam happened to sample the local pizza while he was ashore. His response was the one we all usually have -- hey, this stuff is great! Sam ended up opening a restaurant in Ontario called Satellite not long after he arrived in Canada. He started out serving the typical Americanized diner menu that was popular at the time. He never forgot that treat he enjoyed in Naples, however, and he soon noticed that pizza was starting to make its way onto the menus of other Ontario restaurants. Unfortunately, the pizza that was being served there at the time was pretty dull. Ontario didn't see nearly as much Italian immigration as places like New York and Chicago did, so the recipes were very basic and not so authentic. You could only really get it in plain cheese form or with canned mushrooms and some pepperoni on top, and no one had the specialized pizza ovens needed to make that delightful crust, so they were basically just heating up the dough in regular ovens at far too low of a temperature. Sam knew from experience that pizza could be so much better than this. But since his experience with it was so brief, he also didn't really know what would make for better toppings. So he just started experimenting with stuff he already had around the restaurant. He hit upon a lot of ingredients that would actually go on to become classics, like black olives and anchovies. However, his big creation was inspired as the newly-added state of Hawaii began to take hold in the imaginations of Americans and Canadians alike as a tropical island paradise. There was a cultural obsession with Hawaii in the 1960s, and Sam started thinking about ways to create a pizza to capitalize on it. One side benefit of Hawaii joining the United States was that canned pineapple became commonly available in grocery stores both there and in Canada. So Sam decided to try that on a pizza, apparently adding ham to the mix just because it was inexpensive and readily available. He had already been experimenting with selling Chinese dishes at his restaurant, so he knew the combination of sweet and savory had a lot of potential. By simply putting some pineapple rings and ham on a pizza, Sam unleashed one of the most controversial food creations ever. While people still argue its merits to this day, it was a big hit with his local customers and was soon adopted by other pizza places in the area, eventually spreading throughout the world. 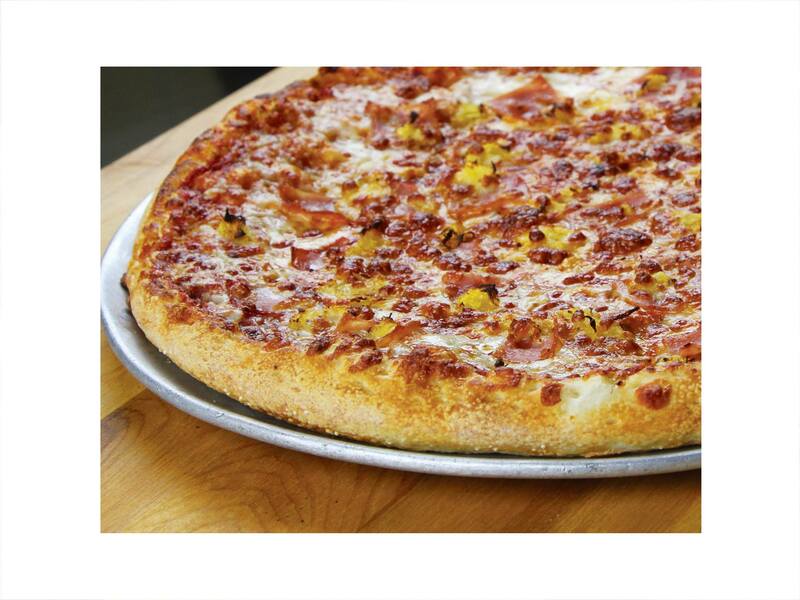 As you can tell from our menu, we've embraced the sweet and savory with our Husson's Hawaiian Pizza. We know it's not for everyone, but fans of it just can't get enough! Our Hawaiian Sub provides a similar taste explosion, but we've added tomatoes, lettuce and salad dressing to the mix. If you've never tried it, definitely check it off the bucket list ... and if you've tried it elsewhere in the past, we think our version might just change your mind.